FANUC Servo Drive Repair Service | Lakeside CNC Group, Inc.
Lakeside CNC Group, Inc. charges significantly less than our competition for any type of repair or retrofit the FANUC servo drives. Free evaluation. Free repair reports. Free technical support. Free pick up services. Call 630-616-0039 or request a quote right here! Here at Lakeside CNC, our FANUC Repair Lab has been designed to provide our customers with the highest quality for all repair services. Our team of highly qualified engineers handles all FANUC servo drive repairs to the greatest level of professionalism always with customer satisfaction in mind. If you have a failed FANUC servo, we can restore it to “like new” condition according to the manufacturer standards. All FANUC servo drive repairs are done using the highest level of technology available to us and all FANUC servo drive repairs are fully tested on the appropriate FANUC test simulators to simulate real operating real operating environments and loads. All FANUC servo drives are always cleaned before repair process starts, preventing contamination, false readings, damages not seen by the naked eye, corrosion damages. Then, your unit is thoroughly tested and repaired before being run on our FANUC test simulator, usually overnight to 24 hours of running time before it passes our quality seal of approval. At Lakeside CNC we don’t just repair the defective drives, we also update, upgrade them due to the high rate of failure to preventing future problems at the same time complying with FANUC America’s standard. We repair most FANUC servo units, including, but not limited to, the following series: A06B, A06B-60, A06B-6047, A06B-6050, A06B-6057, A06B-6058, A06B-6066, A06B-6070, A06B-6079, A06B-6080, A06B-6089, A06B-6090, A06B-6082, A06B-6093, A06B-6096, A06B-6110, A06B-6114, A06B-6117, A06B-6130, and A06B-6134 products. 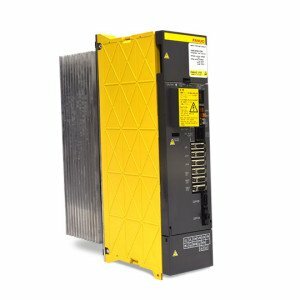 Our FANUC servo drive repair service come with a 1 year warranty for all new, refurbished and repaired servo drives. Brand new and refurbished FANUC servo amplifiers are ready for exchange. Check out FANUC AC Servo drives (and DC as well) sections in our online catalog!